You all have made a lot of requests for printables and lesson plans. I have a long list of ideas in my head, some of them jotted down on bits of paper floating around my house. I'm excited about sharing with you some of the resources that I have created for my own children. This has actually turned into a major undertaking, because normally I just snag pictures here and there to use with my kids with little to no thought about copyrights and such. But I am extremely pleased with my first set of printables. I am especially grateful to Maree Truelove whose clipart I used for this set of seasonal calendars. 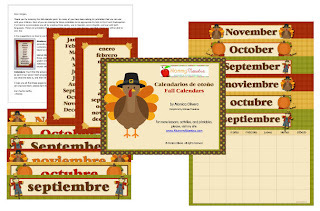 Because we use them everyday in school, I have created a bilingual set of calendars and calendar-related printables. And to tie them into the season, I have centered them around a fall theme. Since September is already over, this pack will be free to download through this weekend only (October 2nd). Afterwards, it will be available for purchase. Enjoy! UPDATE: Wow! I'm not sure I expected so many of you to race over here and download these. I hope you enjoy them and are able to use them contructively with your children. 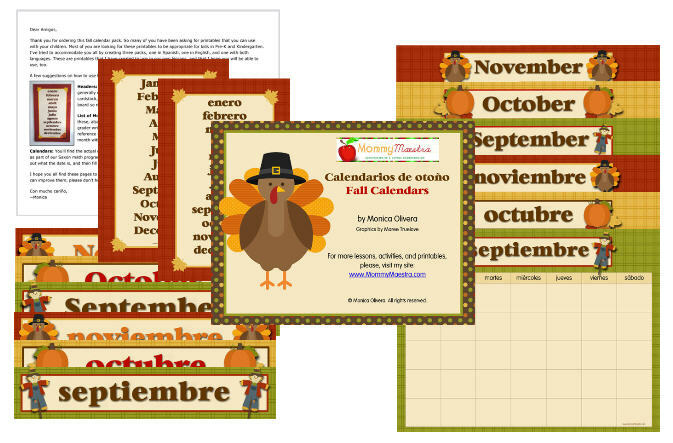 This bilingual calendar pack is now available for purchase in my TpT shop. Monica!!! IT'S SOOO BEAUTIFUL!!! HAS ESTADO MMUUUUY OCUPADA!!! !LOL Me encanta, pero no lo puedo bajar!!!! me ayudas???? Aww. Gracias! Karen, do you still have my email? (It might take me forever to find yours!) If you send me a message, I will send you a zip file. I love your work, FYI the months in Spanish start with capital letter like they do in English. Thank you for sharing! Also, none of the Spanish speakers that I had review the calendars thought that I should capitalize the months. However, if you are interested in a set with the Spanish months capitalized, please contact me through my contact page, and I will be happy to create a set for you.